I am very thankful to have received a blogging recognition. 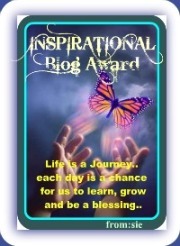 A co-blogger, my loyal and frequent blog visitor and commenter, now becoming a dear friend had bestowed me this Inspirational Blog Award. Thank you Sie! I hope my writings will continue to be of inspiration and substantial to my readers. I will be rendering this distinction to other bloggers who also share musing articles. 1. What makes you laugh, smile or giggle? I laugh out loud on family bonding moments, when we watch funny dvd movies, when we share funny stories, when I talk to my best blogging friends who usually crack jokes which I can’t help laughing. While, a simple gesture of a warm greeting makes me smile. I giggle when my husband send me text messages on how he misses me during the day that he’s out for work then wrapping up with warm embraces in the afternoon when he comes home to call it a day. 2. What are your dreams for your future? Simple dreams of seeing my children fully established on their own. My husband and I to grow old together in a farm life. 3. If you are to go to a cruise, where would it be and why? I want to see the spectacular sceneries of Alaska and cruising with the Royal Caribbean, a great family treat! 4. How would you spend your vacation time and with whom? I always value my family, I would always want to spend my vacation time with my kids and husband. 5. If given a chance, what life would you choose? Your life now or your past? I will choose both. 6. Is there something that you wished before when you were young but you didn’t get it? I have no regrets in life, though the journey I traveled when I was younger was a bumpy one, the past actions did not made me upset nor regret. 7. Have you been in a situation where you might have given up but still you chose to move on? Yes, a lot of times. It is a very difficult time in my life but I hold on to my strong faith in HIM, he never had forsaken me. 8. Is their someone in your life who has been your source of strength and inspiration? My husband, my two sons, my mom and most of all the Almighty Father up above are always the source of strength and inspiration. P.S.Ms.Joy I had a hard time leaving a comment on your site po that's why I have not left a comment on some of your post po..lagi po naghahang..this is actually the eight try ko po just to leave a comment.. I do not know what's wrong with my comment system Sie :(, I tried using a different browser to try commenting and it's working well on my end Anyway I will still try to troubleshoot the possible problem it might be causing. You deserve the award bec you are indeed an inspiration :) Congrats!